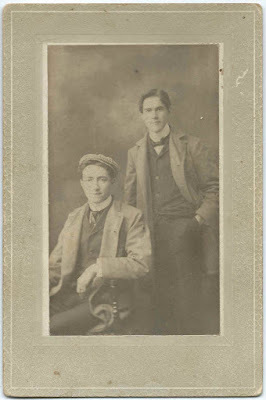 Photograph of two young men with the name Mrs. Rich, possibly their mother, written on the reverse. 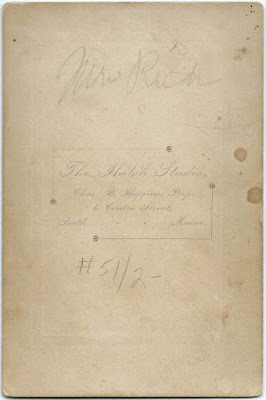 The photograph was taken by the Hatch studio at 4 Centre Street, Bath, Maine, proprietor Charles R. Higgins. The photograph, matted, measures approximately 5-1/4" by 3-1/2". Rich appears to have been a common surname at Bath, Maine, during the relevant time frame. If you recognize either of these young men from your family photographs and/or research, please leave a comment or contact me directly.